Home dental care is one of the most important ways to maintain your pet’s health. Dogs and cats with unchecked gum inflammation may be at higher risk for heart, kidney, and liver disease. And, unfortunately, dental disease is by far the most common major health problem of cats and dogs, making caring for your pet’s teeth just as important as providing him with a well-balanced diet, plenty of fresh, clean water and proper exercise. The best way to avoid the complications that come with gum disease is to establish a dental routine with your pet as early as possible so he or she can become accustomed to the brushing process. The first step is to establish a routine. In an ideal world you would brush your pet’s teeth every day, but if daily is not possible 2-3 times a week is recommended. There are numerous dental care products, pastes, solutions, brushes, chew toys and dental diets that can help you provide your pet with the dental care she deserves. Once you’ve figured out your timeline, buy the necessary supplies, and take things slow. What should I use to brush my pet’s teeth? The most precise tool you can use is a moistened dog or cat toothbrush with soft bristles. If you do not have a specially designed pet toothbrush, you can also use a child’s toothbrush (adult brushes are too big and rough for most pets), a finger toothbrush, gauze around a finger or a cotton swab. Specially formulated pet toothpastes are your best option. They come in many flavors like poultry, malt, mint, vanilla and other pet-friendly varieties. The brand you choose does not matter as much as finding a toothpaste your pet will enjoy. Try a few different flavors and brands to see which one your pet likes best. Give your pet a few tastes so she can enjoy the flavor before you actually start using it with the toothbrush. Never use human toothpaste, baking soda or salt. While safe for humans, these cleaning agents can be harmful to your pet if swallowed. Silica – Abrasives like silica are effective at scraping tartar away from the tooth’s surface. Enzymes – Proteins that work to reduce bacteria in your pet’s mouth (which also helps keep bad breath at bay). 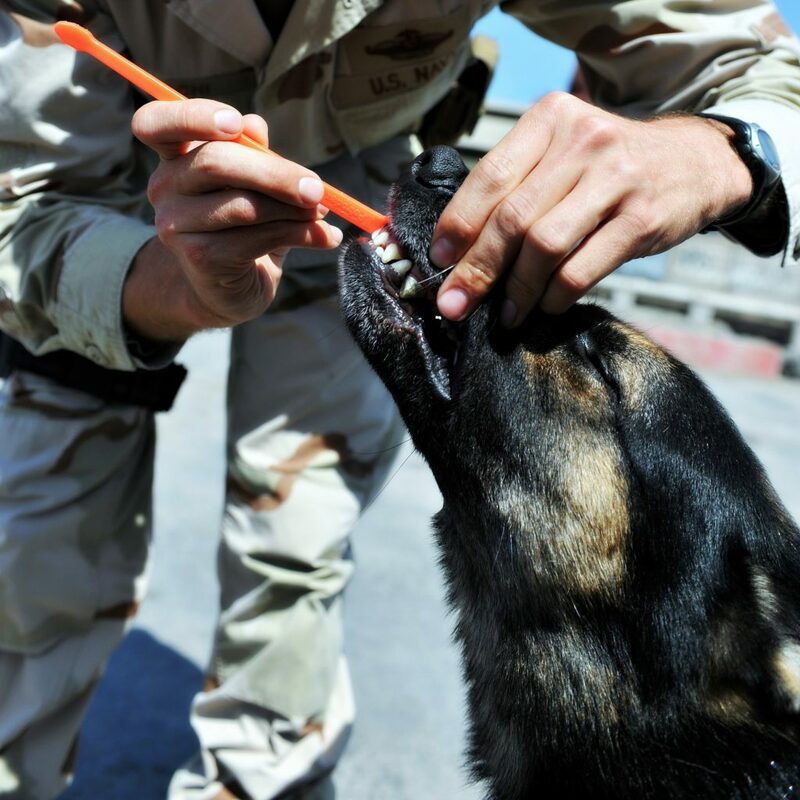 Sorbitol – A sweetener for taste that is added to some commercial toothpastes (not to be confused with Xylitol, which is also a natural sweetener, but is toxic to dogs). Find a comfortable place for your pet to sit during the tooth-brushing session, like your lap or a favorite resting spot. Lift the lip to expose the outside surfaces of your pet’s gums and teeth. Brush with gentle motions to clean the teeth and gums. Aim for at least 30 seconds of brushing, but follow your pet’s lead, if you can only get a few teeth the first time praise your pet and try for longer next time. Focus on the outside (cheek-facing) surfaces, as most pets will not allow you to brush on the inside surfaces. Don’t forget the back upper molars and canines, as these teeth tend to build up tartar quickly. Reward your pet with a treat, petting, play or a favorite activity to positively reinforce the brushing process.